How large can snowflakes get? The answer is: pretty darn big. Like many people, I enjoy keeping a page-a-day calendar on my desk and learning tidbits of trivia as I tear each day away. Recently, though, one of these tidbits stopped me cold. It was about the largest snowflake every recorded. "Did you know," the calendar read, "that the largest reported snowflake measured 15 inches (38.1 cm) wide and 8 inches (20.3 cm) thick?! It was discovered by a ranch owner in Fort Keogh, Montana, in 1887." No, I did not know that. A 15-inch snowflake? How could a snowflake possibly grow that big? And what would it have looked like? Luckily, I knew just who to ask: NC State's Sandra Yuter, faculty fellow at the Center for Geospatial Analytics and a distinguished professor in the university's Department of Marine, Earth and Atmospheric Sciences. Yuter uses information from satellites, radar and other sources to answer scientific questions related to weather and climate (her latest discoveries about marine clouds were published in Science last summer). She often studies winter storms that cover large geographic areas, but Yuter is also an expert on the snowflakes themselves, and how bizarre they can be. When we think of snowflakes, most of us envision the symmetrical, lacelike patterns that adorn greeting cards at this time of year. But the vast majority of snowflakes are not so neat and tidy, Yuter says. Most snowflakes are downright lumpy, made up of many individual ice crystals as well as frozen water droplets that resemble fuzzy snowballs. "You rarely get ice crystals that are pristine and perfect," Yuter says. "As snowflakes fall at slightly different speeds, one will overtake another and they'll lump together." For more than five years, Yuter and her collaborators have been studying the shapes of snowflakes in freefall, first in Utah and now in Stony Brook, New York. Using a Multi-Angle Snowflake Camera (MASC), they have captured some stunning images. One goal of the work is to better understand the inner workings of snow storms––from the tops of the clouds to the ground––and improve forecasts of local snowfall. What do snowflake shapes have to do with it? 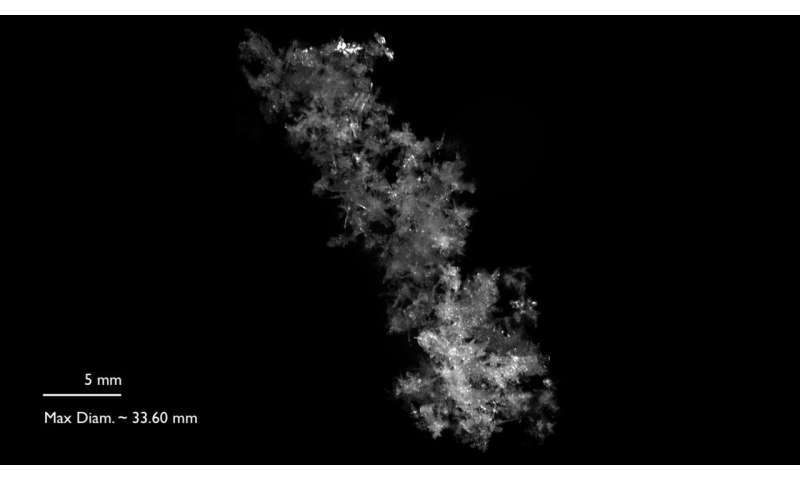 Snowflakes' shapes record what was happening in the clouds where they formed, because different temperature and moisture conditions affect the way snowflakes look and grow. "Snowflakes are little histories of what they've been through," Yuter explains. Snowflakes form when water molecules in a cloud pass directly from water vapor gas to solid ice, skipping over the liquid phase to form an ice crystal. As these ice crystals fall and swirl through the clouds that formed them, they form larger flakes by continuing to grow, clumping together, gathering freezing water droplets, or all of the above. Water droplets that freeze on contact with an ice crystal create tiny snowball particles. And when multiple snow crystals clump together into a jumble, the snow particles they form are known in meteorological circles as aggregates. The largest falling aggregate snowflakes Yuter has photographed have been about 1.5 inches (about 4 cm) across (see photo above); that's partially due to the size limit of the MASC but also due to large flakes' rarity and difficulty to measure. There's really no telling how large an aggregate snowflake might get while still airborne. "We don't know how big they can grow within the snow storm," Yuter says, "because wind conditions typically conspire against giant flakes ever reaching the ground intact." The jumble of crystals that make up an aggregate snowflake tend to be only loosely connected, and the overall structure is consequently very fragile. Wind or other air turbulence can easily break the delicate aggregate into smaller pieces on its way to the ground. That means that the record-setting flake of 1887 – the one that was considerably larger than a football—would have needed to fall in very calm wind, or no wind at all. In addition, the moisture in the air would have needed to be quite high, to allow the flake to gather a plethora of ice crystals and frozen water droplets on its journey down to the ground. That enormous snowflake would also have looked very different from the ones we usually imagine. There is no photographic evidence for the giant flake, but Yuter says that if it existed, it was probably a variation of what she has observed in her own work: a very lumpy aggregate. It might be tempting to envision a perfectly symmetrical giant snowflake, but the reality is much more interesting. "What do big snowflakes look like? A jumble of little flakes," Yuter explains. "In natural conditions, it is highly unlikely that the record snowflake from 1887 was one giant crystal. Much more likely is that it was a jumble of crystals together." To date, she has collected images of over two million snowflakes, many like the photo above. "This," she says, "is what real snow looks like." Yes, Virginia, some snowflakes can look the same! Video: How do snowflakes form? In the Oregon Coastal Range, just outside Cottage Grove, in the early 90's we had a Very Heavy Snow, and the snow, as my brother and family were witness to, was coming down in Thuds. They were about dinner plate sized flakes between two and three inches thick and landed fairly heavily making distinct thudding sounds on roof and deck at the time. There was ample damage to trees. But my brother and I still joke about the night we had snow coming down in Thuds! In the middle 90's, don't remember exact year, mid Dec., Soldotna, Alaska, about 75 air miles south of Anchorage, I and several others observed and frolicked in a snowfall with flakes like the comment above, dinner size. They were light weight, floated down only a bit faster than regular flakes - no Thud. Several times I would choose a very large one and put my face up to let it completely cover my face as it fell on me. We all were quickly and completely covered. The temp was high 20's. Almost no snow on the ground prior to this and within 30 to 40 minutes there was over a foot of very light unpacked snow on the ground and it quit. Most amazing snowfall I ever saw and the funnest too.